tiny flowery type succulent. a bit viny. maroon colored ground cover. Hi Katie, this is one of my favorite plants, and my stock in trade - Sedum, or stonecrop are hardy and tough, yet have such charm and offer bright foliage, lovely blooms that attract many butterflies and bees, and can withstand really challenging conditions. 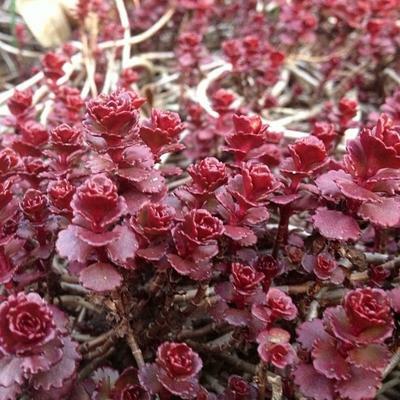 This is one of the Sedum spurium tribe - there are many to choose from; the mahogany or dark red ones are renowned for their hues; Dragons Blood, it's similar cousin Fireglow and the new Voodoo are only three of the great varieties of this species that you can find. Others include Red Carpet, Elizabeth and Coral, among others. Enjoy your delightful red plant.